Fans of Doctor Who figures have long been frustrated by the search for the elusive black Dalek Sec. But now the chance to own a life sized one is a reality in an upcoming auction. The Dalek Sec appeared in Series 2 in The Army of Ghosts and Doomsday and Series 3 in Daleks in Manhattan and Evolution of the Daleks. Showrunner Steven Moffat owns a life size Dalek, as he revealed in Doctor Who Magazine #500. Many fans would love a chance to own one as well. TV Production company, Crook Productions is currently making a new TV show, hosted by a celebrity that will see viewers bid on an eclectic mix of items ranging from expensive antiques to a secondhand speedboat or other unique memorabilia. Everyone It’s a chance to re-home these one-of-a-kind items to a home that will love them. The life size Dalek Sec model breaks down into three parts, making it easier to transport and assemble inside the home of the lucky new owner. 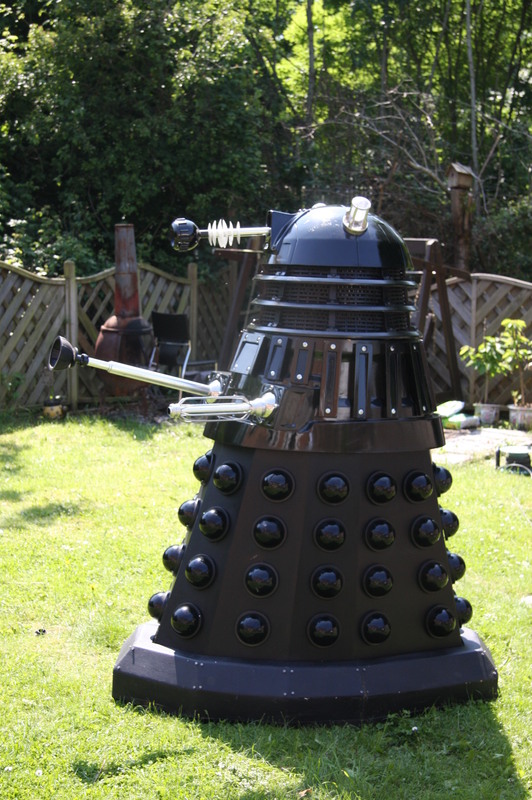 Best of all, there will be a chance to bid on the Dalek Sec before the auction takes place on Tuesday 26th July in Bristol. Crook Productions is a UK based Television company specialising in Factual Entertainment, Entertainment and Archive shows. Some of their other shows include a new Derren Brown show on Channel 4, a dating show on ITV, Honey I Bought the House, and Katherine Mills: Mind Games. For more information, see the website. it is a lawn robot? or only stand in the garden and do nothing?